Costa Rica is arguably one of the most beautiful countries in the world and what better way to experience it than combining the thrill of camping with the traditional comforts of a luxury hotel. Isla Chiquita is Costa Rica’s first, and only island-glamping destination. With an abundance of exciting activities on offer, including the magnificent bioluminescence experience, you’ll be spoilt for choice on things to see and do. Glamping in Costa Rica is sure to be an unforgettable experience. On Isla Chiquita you will be provided with your own specialised tents set on pillared platform decks, creating your own private space to relax and unwind whilst enjoying all the elements of luxury on your ’back to nature’ getaway. Each tent has a king size bed, a private bathroom and shower and a spacious al fresco viewing deck so you can soak up the sensational sights and sounds of this tropical Island. Surrounded by the beautiful waters of the Gulf of Nicoya, Isla Chiquita is the perfect spot for adventurous travellers still looking for that home from home feel. An exciting array of activities are available for you and your family during your stay on this special island. Whether you wish to take a self-guided kayak or a stand up paddle board to marvel at the birds in flight or the marine life that glides through the waters, it’s the perfect combination of relaxation and adventure. You could even voyage across the islands, finding a new one to explore each day, enjoying snorkelling and swimming, or simply relaxing and soaking up the sun. One experience you simply can’t miss is the bioluminescence expedition, blending adventure and magical sights. The waters that surround Isla Chiquita hide a glimmering secret. Through a guided after-sunset boat excursion you can spot a faint glow in the water that becomes brighter and brighter. Marvel at this natural phenomenon where tiny organisms give off bursts of fluorescent blue light in response to movement creating a mesmerizing spectacle. Alongside these incredible and unique displays of nature, Isla Chiquita also holds a beautiful selection of seaside restaurants. Donde Tía Nora’s Restaurant and Harry’s Bar offer exquisite fresh-catch specialities and delicious cocktails, whether you’re looking to try Costa Rica’s culinary delights or enjoy a quick nightcap, these two spots are a perfect choice. 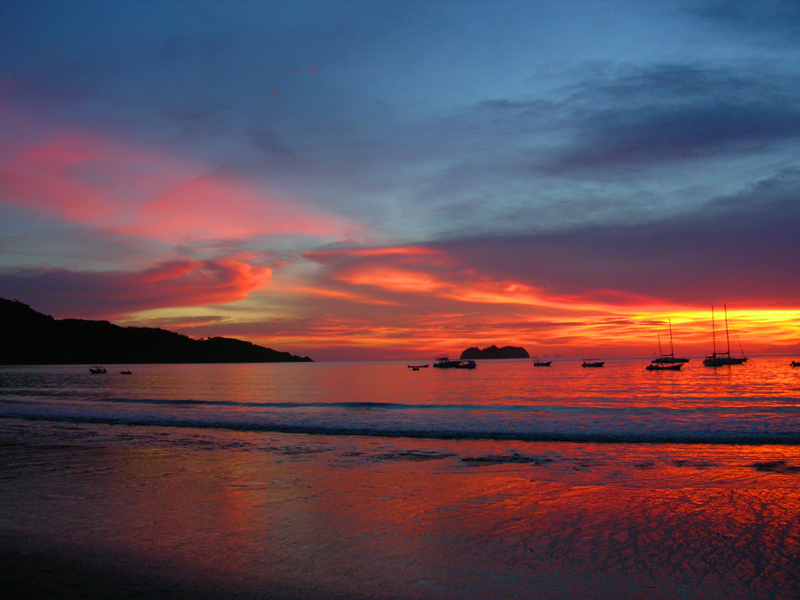 Costa Rica’s Gulf of Nicoya offers a treasure trove of islands and fishing communities that hold a hidden array of tradition and culture. Soak up the culture of the local neighbourhood and learn their traditional fishing methods and see first hand how your participation helps the community. With over 100 different species of fish, you’ll get to sample some of the freshest seafood you have ever tasted whilst learning about the sustainability of their fishing traditions. Isla Chiquita glamping is an eco-luxury experience that the whole family will enjoy. Unique and magical accommodation, exciting and adventurous activities, combined with incredible tropical wildlife will ensure you have the adventure of a lifetime in this small corner of paradise. To find out more and book your bespoke Costa Rican adventure, call 020 8246 5300 or click here.